Apologies in advance – this is a long post. You could just skip it altogether, or look at the pictures and watch the video. Thanks for getting this far. This week I have been engaging with De Leuze and Guattari’s ideas of the Nomad and trying to make sense of it in a context that has some meaning for me. Earlier this week we had a discussion on #rhizo14 Facebook group about textiles that led me, via Thousand Plateaus reader by Eugene Holland to the Section on the Technology Model in Chapter 12 that uses textiles in the as an example to distinguish between nomadic and sedentary use of technology. At first I was a bit puzzled, as my experience of felting involved boiling either knitted items, or ones sewn from woven wool. I have a felting needle but have never used it. I didn’t know how felt was made traditionally, and this video of Mongolian nomads showed me by letting me see them do it. The wool comes from the sheep they bring with them on their travels, the technology used is shears and sticks, and the felt is used to cover their yurts. The technology of felt-making used by the Mongol nomads is portable and does not interfere with their wandering: the yurts can be erected and covered with felt very quickly. The technology they use helps to smooth the space for nomads, and works well across huge spaces. The tragedy for Mongol nomads is that the furrows (striations) produced by state spaces have increased relentlessly to the point where they are now apparently a tourist experience. We are all familiar with the depiction of school classrooms as striated spaces, children confined to desks arranged in serried ranks (usually in a sepia photograph dating from the late 19th/early 20th Century), authoritarian teacher orchestrating children all reading from the same book, or learning by rote. The 21st Century classroom is depicted in glorious technicolour, children lazing on brightly coloured foam shapes, clutching their ipads as they talk to other children across the globe, or find out about Mongol Nomads as I did, by finding and watching a youtube video. I know where I would rather have been when I was at school. To me the rich discussion was crystallised by the introduction of an ‘old’ post by Bon Stewart who encouraged us to use rhizomatic learning lenses to see ‘differently’ – to avoid conflating learning and schooling. Of course, the constraints imposed by assessment on our smooth local spaces within institutions are just a shadow of the state space that lurks behind them – institutions, government policies. Many teachers (at different levels of formal education) have demonstrated on #rhizo14 their effective use of the Internet to smooth their students’ learning experiences by reaching out beyond the institution or bringing fun tools into the classroom. Teachers and students are still operating within those arborescent institutions. Students can become better at learning but rupture from the tree is partial and sometimes illusory, as I know from my own bitter experience. Meanwhile the ‘subjects’ of pedagogical innovation, the students, are gliding around spaces provided by start-ups and more established providers of social networking spaces – Twitter, Facebook, Snapchat et al, outside of formal schooling. They may find out the hard way, for example that tweets are not private and that the institution is willing to invade these smooth spaces to retain control. It has been painful to see some institutions’ clunky appropriation of smooth spaces – eager to slide across Twitter retweeting positive comments from students but alarmed when negative words and association cause them embarrassment. 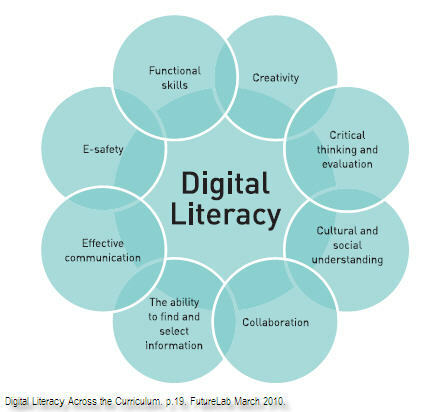 Digital literacies are important for institutions, teachers and students. Digital literacies can be the felt blanket that keeps us warm as we go out onto the Internet from the classroom, and the armour that protects us from the chief Ant that is our own institution. If we are all to be change agents, exploring new frontiers, not just in our classrooms now, but in the future and in society more widely, then our digital literacies will not only encompass ways of handling uncertainty but recognise the uncertainty inherent to digital literacies themselves. 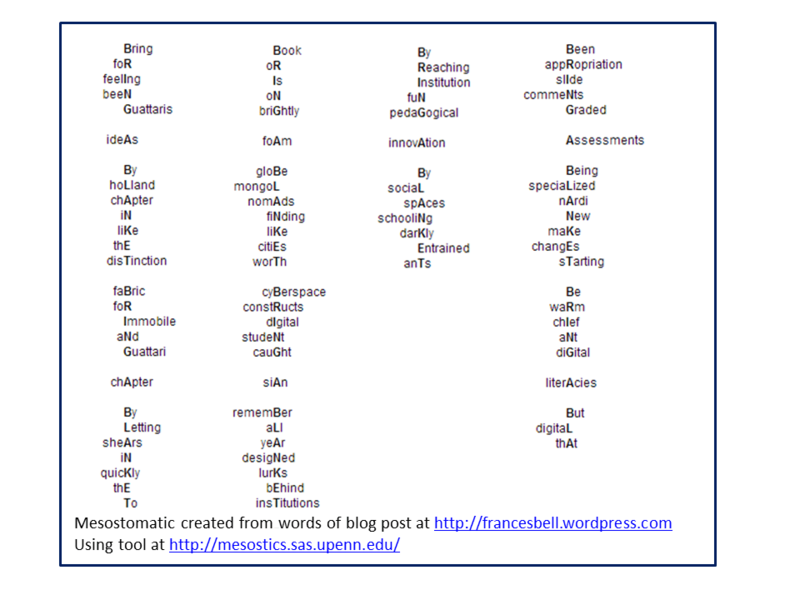 As Jenny Mackness might say, we need emergent digital literacies. But that is another post, provisional title ‘Facebook and other chief Ants’. Lovely, Frances. I loved the video. My sister is married to a farmer and I was particularly struck by how calm the animals are being shorn by this method compared with others. Look how stressed out the animals are here: http://www.youtube.com/watch?v=53KoRxxr1jc I was chatting to students about assessment and Turnitin last week, and realised just how stressful HE makes assessment nowadays, as you highlight. I’m lookimg forward to hearing more about the chief Ants. Those videos are quite a contrast – in the one you posted the sheep are herded , something that DL & G talk about. The chief Ants come from Simon’s post. I am going to apply that idea to Facebook and other SNS, taking forward the digital literacies ideas too. I am sure I can cobble it on to whatever is the Week 4 topic – being the cheat that I am. As you mention Turnitin, just to mention that the power exercise I posted yesterday generated a LOT of discussion about Turnitin in my last couple of years at Salford. New masters students, mainly from the asian sub-continent but also from the MIddle East experienced a huge culture shock (too long to detail here), a significant element of which was use of Turnitin, combined with rather draconian ramped up penalties – they entered at top ramp ;( I believe that has since been toned down. Diagnostic use of Turnitin is key I think though not a panacea. We have similar with our masters students. We *try* to encourage a culture of teaching academic writing and proper referencing rather than punishing for plagiarism, but there are some folk who just want students to score under a set percentage (I heard of one who insisted that this be under 20%!) . *Sigh*, more work to do. Others do use it really well, though, so it’s not all doom and gloom. If we don’t want learning to become tourism, we had better learn to do ‘felt’ stuff together 🙂 First steppe – rethinking economy of assessment. I didn’t have space to cover the scrumble, discussed last week on FB – the scope for textile metaphors is great. Second steppe – acknowledge learning practices outside ‘school’ probably not assessed. Frances, it’s as though we were writing together this week. I especially appreciated your reference to felt. My sister-in-law, a former Montessori Teacher now makes hand made felt dolls in her etsy shop Brigit’s Bell. She only uses high quality hand dyed felt like you describe here. I was just looking at that yesterday. When you spoke about the Ants, it reminded me of this article that I stumbled upon this week. The author coined the word rhizomANTic. Read more here….http://issuu.com/gfbertini/docs/rhizosemiotic_play_and_the_generativity_of_fiction . I also agree, that, like the Knowmadic Society, we are not just changing our classrooms, we are changing our societies. Great post. I didn’t take the shortcut. I couldn’t find Brigit’s Bell – but sounds lovely. Once found a Japanese woman on flickr who makes model felt dogs, cats from the actual animal hair – how bizarre is that? your own mini-Rover made of Rover. Skimmed through the article – will look later. I am not an ANT expert but did some work where I used it to compare with Connectivism – as both use idea of networks of humans and non-humans. One takeaway from ANT is that rather than look at network as entity, they look at its formation and decay – could be quite useful here I think. I think you will appreciate the ANT article. Misspelled the shop. Here is the link. Nice to be on the same wavelength. Since Oct 2012 – etsy have redefined the meaning of handmade. Looking forward to reading the paper. I love the little gift. These guys are just so cute. Who knew what you could do with felt. Thank you for the Prezi link. I will check it out. Karen has a FB page for Bridgit’s Bell. https://www.facebook.com/bridgitsbell . I shared your video with her and your blog. She would be delighted to answer any questions you may have about etsy. 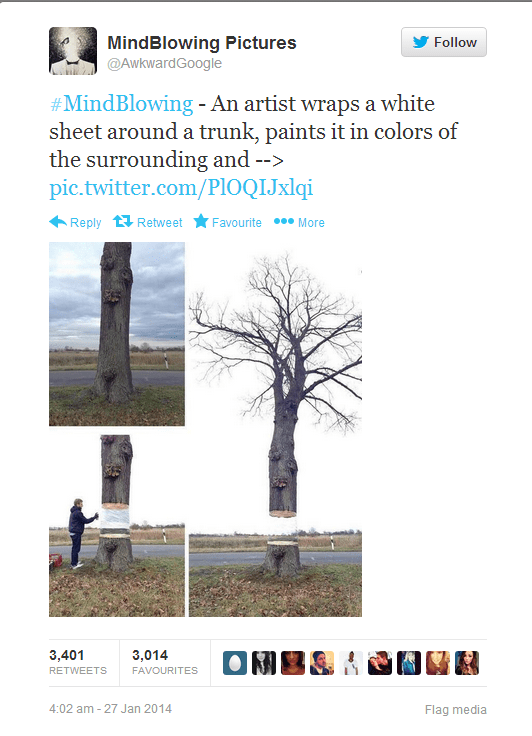 Lots of art communities are rhizomatic. I pointed out Common Threads when Ravelry was being discussed. Looking forward to the ‘ant’ blog. Just an initial thought Emily couldn’t we just survive within the striated spaces of assessment? – go along with the game to get the maximum grade benefit (and/or degree classification) but have personal goals of what we want to learn from this. That would leave us energy for working to fix the ‘bigger picture’ of education and learning, or getting best-paid job and status, or whatever turns us on. Next Next post: Cool webs for rhizo14?